McKee’s 37 Marine & RV Bug Remover & Wax Restorer, 128 oz. Marine & RV Bug Remover & Wax Restorer, 128 oz. Rid your rig of bugs! McKee’s 37 Marine & RV Bug Remover & Wax Restorer is a specially formulated spray-on cleaner that softens and aids in the removal of stubborn bug spatter without compromising wax protection. This incredible formula makes removing even stubborn bugs accumulated over many miles easier than ever before. McKee’s 37 Marine & RV Bug Remover & Wax Restorer makes quick cleanups after a long day of driving possible! Some cleaners claim to be the solution to bug removal issues, but they are so acidic that that can do more harm than good. And if you forget to re-apply wax or sealant afterward? Well, the next bug swarm you drive through could spell disaster for your rig when acidic bug guts eat through your paint! Even a boat trailered to its destination can benefit from the McKee’s 37 Marine & RV Bug Remover & Wax Restorer formula! Pair McKee’s 37 Marine & RV Bug Remover & Wax Restorer with our McKee’s 37 Bug Scrubber for the easiest bug removal process you’ve ever tried. 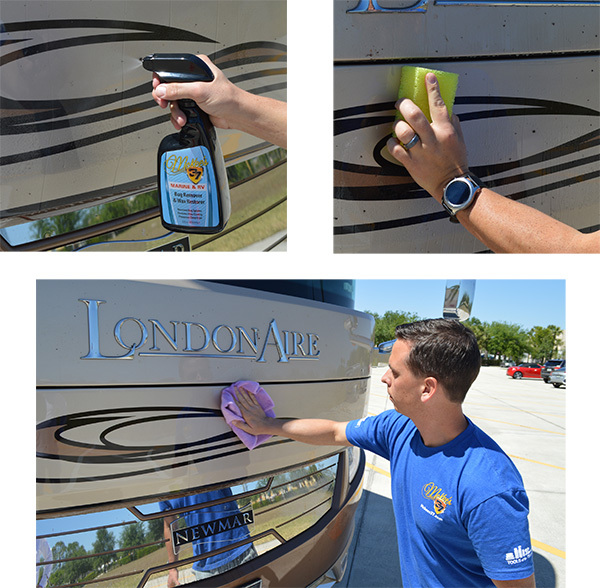 A quick spritz allowed to dwell on the surface for a minute or two will soften and dissolve the most stubborn bug splatter, follow that with a quick swipe of the Bug Scrubber Sponge and your RV (or boat!) will be bug free in no time! Spray Bug Remover & Wax Restorer directly onto affected area. Allow 1-2 minutes of dwell time. Wipe clean using a soft microfiber towel. Stubborn bug splatter may require a 2nd application. For even easier bug removal, pair Bug Remover & Wax Restorer with the McKee’s 37 Road Kill Bug Remover Sponge. RV Bug Remover & Wax Works 5 This product really does work. For "fresh" bugs it is as easy as spraying on the product, let it soak and wipe it off. For older embedded bugs, I found it needed a little more elbow grease, but they eventually came off. Beats any of the Bug and Tar remover products, hands down. And as a bonus, no additional waxing is needed as it leave a smooth wax finish. Pros:Easy to use and no additional waxing needed.